Greminor Lector was chewed out by Malkin Falimede regarding the true scope of the events surrounding CrIsis. After finding out that CrIsis truly was pro Wolfen and even more pro peace, Greminor felt guilt. He also found that Lector’s Revenge had been returned, and he goes back to the pyramid and speaks with his celestial benefactor. When asked what they wished of him with this revelation of knowledge, the entity requested that their new Demi-God, Osiris’ Unyielding Strength be made a holy weapon as the God of Oaths & Vows. Greminor agrees and mentions whom he needs to complete the task and also asks for some specific materials to be provided. Within minutes the Seeker of Isis and Azariel appear, bearing the left and right arm bones of the late giant king, Sunder Blackrock. Azariel only stays long enough to announce this is a gift of the Church of Light to CrIsis and returns from whence he came. The Seeker of Isis is the only member of CrIsis to be informed of Xerx’ses elevation and that this is the gift to be presented upon the Festival of Apis. Greminor uses his magic to create the weapon out of time and shows Indaris the legendary incantations he must read to invoke the gods’ power and make such a weapon holy! Together they create a greater holy flail dedicated to Osiris. Scouring the some of the ancient lexicon dub the weapon, Prodromus Lex, Harbinger of Law. 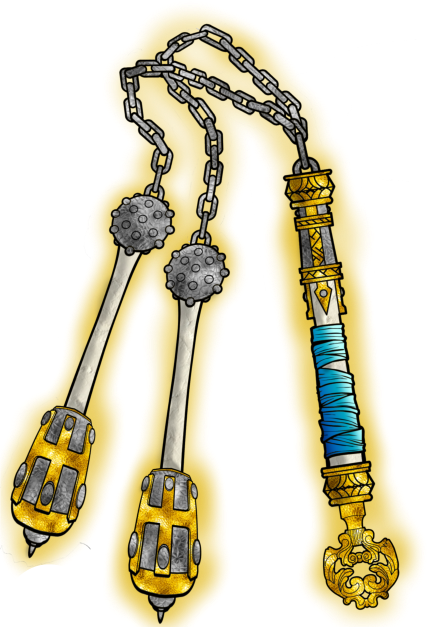 The flail is a two-handed weapon except when wielded by a giant race, like the Minotaur, which Xerx’ses is. ✠ Halo Color: Yellow When Sense Evil activates the Halo will turn red and glow brightly. ✠ Prayer Bonus: +5% When used by a non-priest there is a 5% or 1 in 20 chance of being heard by the deity the weapon is tied to. In this case that deity is Osiris. ✠ Damage: 4D6+6 8D6+12 vs supernatural beings and creatures of magic (including dragons) of selfish or evil alignments. 12D6+18 vs Demons, Deevils, Gods, Alien Intelligences of selfish or evil alignments. ✠ Indestructible: As per the Magical Weapon Property (Pg: 249). ✠ Dark Slayer: Inflicts normal S.D.C. damage +6 points to mortal foes, but does double damage to supernatural beings and creatures of magic (including dragons) of selfish or evil alignments. Does triple damage to demons, deevils, Gods, Alien Intelligences of selfish or evil alignments, On mega-damage worlds, that damage is mega-damage. ✠ Sense Lies: The presence of lies performed in any medium is indicated by the weapon changing color, 20 foot (6 m) radius. The gold metal on the weapon turns black along with the halo color changing. Those caught by this enchantment are compelled to answer all questions, however, they do not have to be truthful. The victim is compelled to answer only the spell caster’s questions, if they lie the detection is automatic within the radius of effect. or many (15 or more). It can also register the intensity of the evil and pinpoint the general location of the source(s) to a particular room(s), possessed object or person, or an approximate distance (very close, near, far, etc.). Evil emanations from human and most mortal beings are much less distinct and cannot be sensed unless the source/person has an immediate and intense evil intention.